1873 was a cool year, guys. Levi Strauss made some major headway in denim tech by adding copper rivets to jean pockets, barbed wire became a big deal, and up in Canada an early version of the Mounties were officially helping people out. In the alternate history of Cowboys & Aliens, however, giant metal scorpion ships stole people and maybe kind of ate them or something. Let's find out more about this paranormal course of events by watching the new trailer for the Jon Favrea-directed film starring Daniel Craig, Olivia Wilde, Harrison Ford, Sam Rockwell and more after the jump, eh?While the new trailer still harbors its share of mystery, it's nice to see Craig's character blast aliens and his fellow humans alike with that wrist-mounted gizmo of his. Hopefully he deals even more delightful damage to his foes when the film opens on July 29. 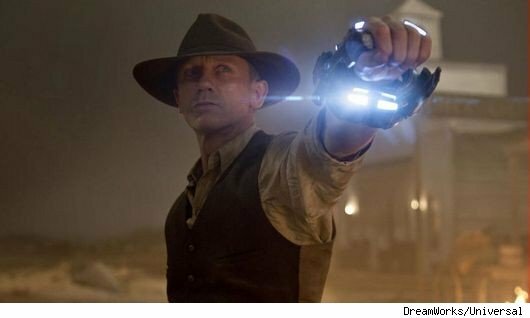 Fans who may have missed Scott Mitchell Rosenberg, Fred Van Lente, Andrew Foley and Luciano Lima's 2006 Cowboys & Aliens comic from Platinum studios can scope the film's 115 page source material for $1.99 digitally or roughly $16.50 in print form.